Gordon Monro describes himself as a generative artist: generative artists design processes that in turn generate artworks, either autonomously or in collaboration with a human. In Gordon's case, the generating system is a computer program and the artwork is made in a digital medium: digital prints and videos, or a display generated in real time by the computer. 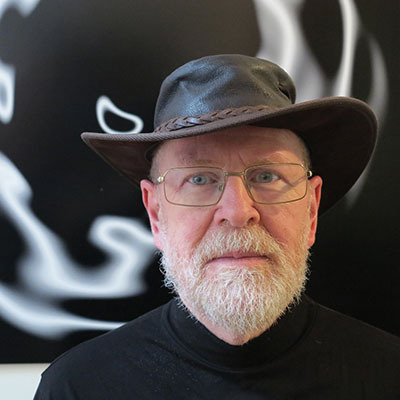 Gordon draws on his background in science and mathematics to make works that in large part draw their inspiration from realms outside the confines of purely human concerns. His primary sources are geometry and pure mathematics, the natural world as seen by modern science, and the new world of artificial intelligence and autonomous computing devices. Gordon also draws on the history of Western abstract art, in particular constructivist art and minimalist art. There are several ways of spelling my surname. If you are looking for Gordon Monroe or Gordon Munro or Gordon Munroe I may or may not be the person you want. However, my name is actually Gordon MONRO. Since there are several ways of spelling my surname, people often misspell the "Monro" part of my name; I found I couldn't base my domain name on "Monro", as if I did, people couldn't find me. I chose "Gommog" because it was available as a domain name (the main consideration), it was short, and it was related to my real name, being derived from the first two letters of "Gordon" and the first two letters of "Monro". When I started using "Gommog" nobody else was, as far as I could find out. Since then, I have come across across two or three other Gommogs. I don't have any connection with any of them.